I'd often noticed that our dinner table was quiet. Our attempts at spurring on a conversation with the girls rarely went beyond - How was your day? What did you do today at school? To which we would inevitably get one word answers. In the back of my mind I remembered hearing about conversation starters you could use with your kids. I thought something like this may really faciliate a conversation with us at dinner time. So off I went to find something like this. 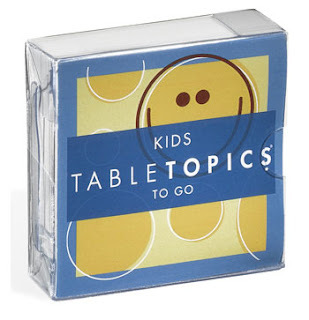 I poked around a bit on Amazon and ended up buying a set of cards called Table Topics. We've used them for the last week or so and it has made an *incredible* difference in our dinner conversation. For starters, the girls LOVE them. I mean, LOVE. 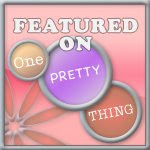 So far the topics have been engaging and interesting for the girls and for us. Our first card had us talking about when we were babies. Another notable one had us choose who we'd rather have for a babysitter - Willy Wonka or Mary Poppins. I was the only one who chose Mary!! Last night we got to create an invention. Honestly, I look forward to dinner time more now. I love the girls' enthusiasm about the cards. They really do get us talking. A lot. Dinner feels more relaxed and we're getting to know each other better. Do you have any dinner time rituals? With three boys, we are just lucky enough to keep them seated.